Product Overview An evolved next-generation analog synthesizer with huge potential for sound design and performance. Controls pitch bend and modulation depth, etc. A desired parameter can also be assigned to the up/down axis. The four voice modes were selected for the minilogue xd. 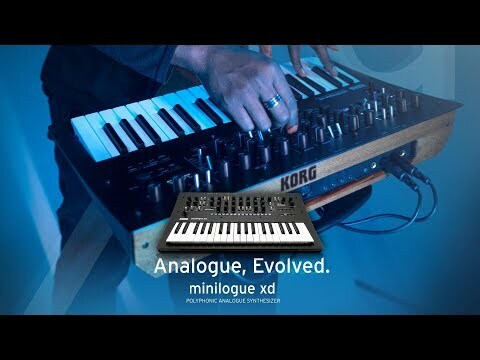 - POLY: The minilogue xd operates as a four-voice polyphonic synth. - UNISON: The unit operates as a monophonic synth, with the four voices working in unison. - CHORD: Chords are produced using one to four voices. - ARP / LATCH: (ARP) Provides an arpeggiator with up to four voices that can also be used while the sequencer is running / (LATCH) Switches latch on or off. A voice mode depth knob is also provided, which applies a corresponding effect for each mode. - POLY: Turning the knob toward the right switches to DUO mode and deepens the detune. - UNISON: Turning the knob toward the right deepens the detune. - CHORD: Selects mono or chord type. - ARP / LATCH: (ARP) Selects the arpeggiator type. The minilogue xd is equipped with the micro tuning function featured on the monologue, allowing you to individually adjust the pitch of each key. Built in are 23 preset tunings that include some created by Aphex Twin and Dorian Concept, and users can also create and store six user scales and six user octaves. Start by trying out the preset tunings of famous musicians, and then advance to creating your own original tunings. The organic EL display is now larger, and also provides oscilloscope functionality for you to view sound as the electrical signal's waveform. This makes parameter changes visible in real time, giving you visual feedback that helps you understand how the synthesizer works. The display can also show motion view for visualizing the movement of a stored motion sequence. A stereo effect unit is provided at the final stage, and the output jacks are now also stereo. Spatial-type effects such as delay, reverb, and chorus will add an even more convincing touch to your thick analog synth sounds and sparkling digital synth sounds. A damper jack has been added in response to requests from artists and users. • Programs: 500 voices (more than 200 preload, 300 user programs). Each program provides a program sort function that includes voice mode settings. Favorite function built in. • Voice Mode: 4 (POLY, UNISON, CHORD, ARP / LATCH). The VOICE MODE DEPTH setting allows different parameters to be varied for each mode. • Dimensions (W x D x H): 500 mm x 300 mm x 85 mm / 19.69" x 11.81" x 3.35"
• Weight 2.8 kg / 6.17 lbs.